Plein Air Painting | What, When, Why, How and Who? As the heat of Summer bears down on us, we thought it would be the perfect time to explore the ins and out(side)s of painting ‘en plein air’. The term ‘en plein air’ is French for ‘in full air’, so to paint en plain air means to paint outdoors – pretty self-explanatory, really. Personally, the image of someone painting outside probably forms my earliest understanding of what it means to be an artist. As a child, I would watch The World of Peter Rabbit and Friends, in which the rain catches author and illustrator Beatrix Potter by surprise, forcing her to gather her paints and easel from her rocky vantage point before the bucolic landscape she had been painting becomes rather more surreal. Nowadays that scene might go slightly differently, with a little less harmony with woodland creatures and a little more use of weather apps, for example, but the benefits and challenges of creating art within the landscape remain largely the same. The practice of painting outside is, of course, likely to be as old as art itself. However, it wasn’t until the 1800s that outdoor artistry became popular in contemporary practice, leading to the French coining the term ‘en plain air’. The spike occurred for a couple of reasons. 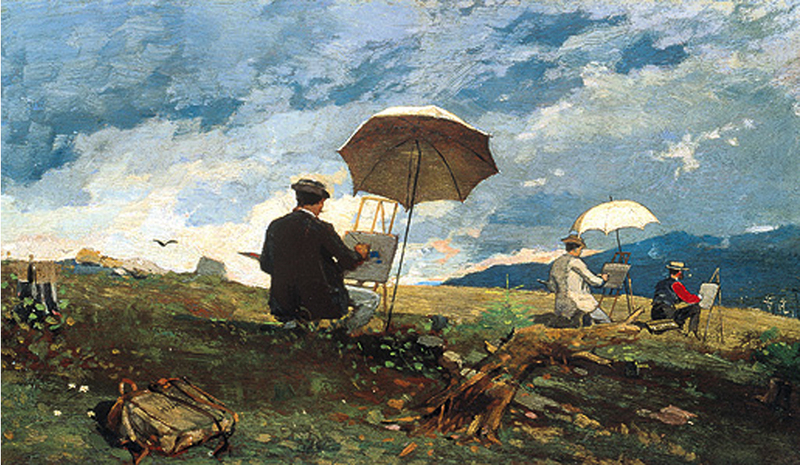 Firstly, the invention of technology such as metal paint tubes and specific types of easels allowed artists to move around much more easily than in previous years, and secondly, several schools of thought were turning to natural light and natural landscape as means to create lighter, brighter paintings. Impressionism, in particular, was all about capturing the moment even as it passed – something difficult to do in a contrived, studio environment. The reasons why the early impressionists painted en plein air are still relevant today. For one, physical immersion in the landscape of your painting allows you to experience it through every sense and capture its ‘essence’ as completely as possible. Also, the challenges of painting en plein air is a good way to escape your comfort zone and push your boundaries – you may need to work with a limited colour palette, for example, or work more quickly. One could even argue that getting outside to paint is even more beneficial than it would have been in the time of the early impressionists, offering time away from the indoors and allowing us to experience things that we otherwise may not have been able to. There are a few easy things you can do to to make the process of plein air painting as serene as it appears to be for our friend Beatrix. Firstly, be prepared – pack as light as possible in terms of art supplies (you can buy equipment such as the easel shown below to help with this, or just get resourceful!) and make sure you take sunscreen, snacks or anything else you might need. This is where that whole 0utside-your-boundaries thing might happen – embrace it! Another good idea is to take some photos – obviously the whole point is to paint in situ, but it doesn’t hurt to have some visual references in case you need to finish something off in the studio. The same goes for other small keepsakes to queue smell or touch – sand, if you’re at a beach, for example, or bus tickets from an urban area. These little objects can be a great way to transport yourself back to that place and time if you can’t be there physically. The list of plein air painters is long, so below are just a few of our favourites (other than Beatrix Potter, of course).